It is an amazing similarity that we have chariots/carts drawn by deer or Reindeers in Rig Veda and Santa Claus stories. Of the Navagrahas, Chandra’s (moon) chariot is also drawn by deer. Tamil Sangam and Sanskrit literature describe goddess is also mounted on a deer (Kalaiyathurthi in Tamil). 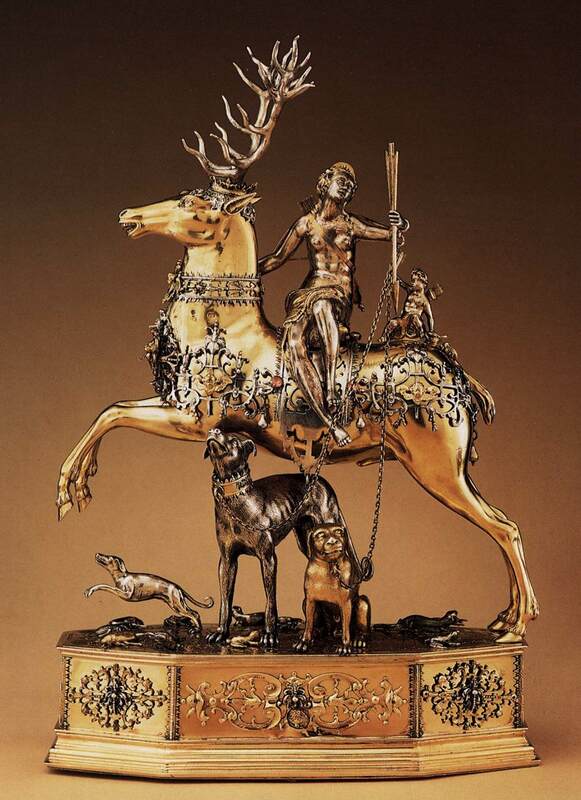 Greek Goddess is also drawn by or carried by a deer. Deer and parrots are associated with Brahmins and seers in Ancient India. They raise parrots and deer in Ashrams (holy cottages). Manu, the Hindu law maker, says that his law is applicable only to Aryavarta where the black antelope lives. Brahmin Brahmacharis (celibates) must wear the deer skin in their sacred thread. Deer is found in Indus seals as well. In the so called Pasupati seal, a god or an ascetic is surrounded by four animals and a deer under the dais. Buddhist sculptures have deer because of Buddha’s association with deer. Chariots drawn by antelopes are as old as Rig Veda. We have references to Marut (Marut=Maruti=Wind God=Hanuman) whose chariot was drawn by antelopes. Marutas are storm gods. They number from 27 to 36. Various origins are assigned to them. They are sons of Rudra, sons and brothers of Indra, sons of the ocean, sons of heaven or earth. They ride golden chariots drawn by ruddy horses or reindeers. They reside in the north. They are armed with lightning and thunderbolts Ramayana gives a different story and their number increases to 49. Goddess Durga has deer as her vahana. Tamil Thevara hymn (Pathikam 921) praised Durga has Kalaiyathurthi=one who rides a deer). Metropolitam Museum of Art in New York has a cup in the shape of a deer on which a god riding a deer holding a bird in its hand is depicted. It was dated 1700 BC from Hittites in Syria/Tukey. Hittites belong to Vedic culture. It may be Vedic god Marut. Artemis, Greek goddess of animals was worshipped from 800 BC. Though she was called Mistress of Animals, she was portrayed with deer. Her Roman counterpart Diana, Roman moon goddess was also shown riding a deer.They can be compared with Hindu goddess Durga and Aranyani and Rudrani, goddesses of Hindu Vedas. They are all connected with forest, hunting and animals. Many of the customs followed by Christians such as Easter Egg, Christmas Tree, Santa Claus are the remnants of ancient religions. They have nothing to do with Christ or Christianity. Though they have found some modern explanations, they existed long before Christ. Santa Claus story is one of them. Encyclopaedias attribute various mythical, historical, legendary folk lore origins to Santa Claus. Modern figure of Santa with white beard and red coat was derived St Nicholas. He was a fourth century Greek saint. Neither he nor Christ has anything to do with North Pole or Reindeer chariots. 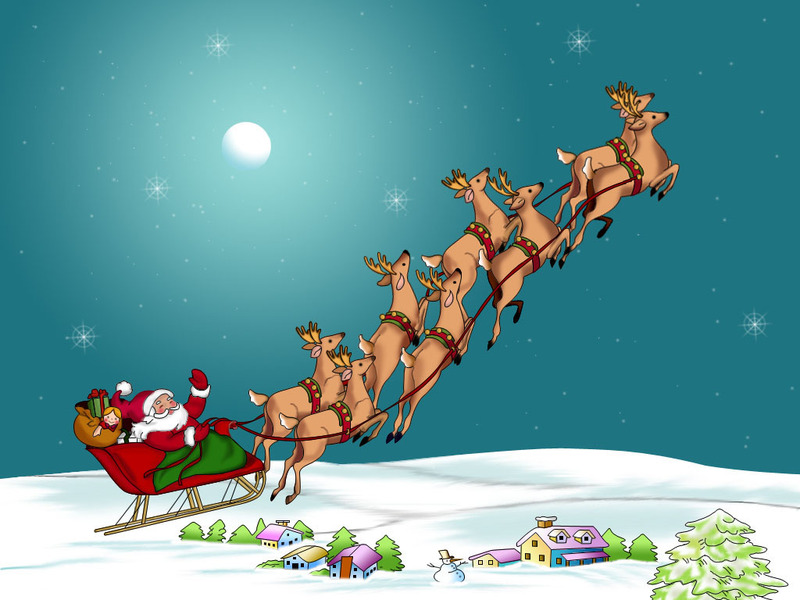 Santa is always portrayed as travelling by Reindeer chariot in the icy regions of the North Pole. In short it is closer to Maruts of Vedas than to Christianity! Vedic mantras are always associated with gifts, but gifts only for priests. We have several Dana Stutis in the Vedas giving a list of big gifts.